He birdied all four of the par-fives and two par-fours but also ran up three bogeys in a round that saw him hit 11 of 14 fairways. The “friend” in question is Dave Phillips, the co-founder of the Titleist Performance Institute, who posted a video of Harrington in action during a practice round on Wednesday. Harrington finished the day tied for 26th place and five strokes adrift of defending champion Dustin Johnson, who birdied the last five holes at Pebble Beach to card an eight under par 64 and lead by a stroke from JB Holmes and KJ Choi. Choi and Holmes, who holed out for an eagle two at the terrifying par four eighth, also played at Pebble Beach where Harrington and his amateur partner JP McManus will tee it up alongside Retief Goosen and Dermot Desmond at 16.11 Irish time today. Harrington and McManus are tied for 39th in the Pro-Am standings on six under par 66 while Goosen and Desmond posted an eight under par 64 to lie joint 15th behind Johnson and his amateur partner Joe Rice, “a cigar-chomping, wisecracking personal injury lawyer from Charleston.” Johnson and Rice posted an impressive, 13-under par 59 on day one to lead the Pro-Am by a stroke. Harrington began his round on the back nine and mixed birdies at the par five 11th and 14th holes with bogeys at the par-four 13th and 17th. He birdied the par-five first to get back into the red, picked up another shot at the par-four fourth and then recovered from a bogey at the par-three fifth with birdies at the par-five seventh and the par-four ninth. 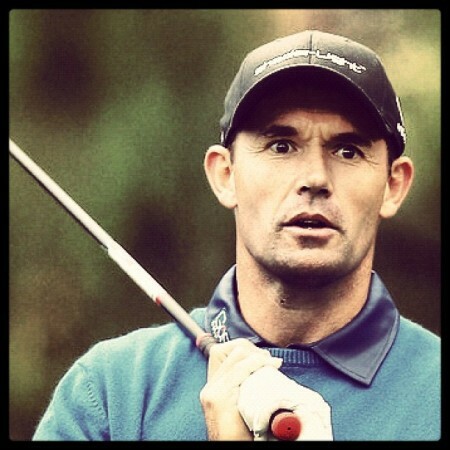 Padraig Harrington had his troubles at Spyglass Hill last year (above) as well. Pádraig Harrington had to settle for a rollercoaster 72 as Shane Lowry’s rivals for a WGC-Accenture Match Play place suffered contrasting fortunes in the opening round of the AT&T Pebble Beach National Pro-Am.